Water resistant pressure sensor for measuring hydrostatic pressures in the range of 0-0.5 mWC up to 0-100 mWC. Electrical Connection: IP68 integral cable with a PUR, PVC or FEP jacket. The IMSL submersible pressure sensor utilises a silicon strain gauge sensing element which offers a very linear accuracy performance over the hydrostatic pressure range with minimal hysteresis and repeatability errors. Silicon strain gauge diaphragms also make it possible to measure very shallow depths without the need for increasing the diameter of the probe. The IMSL has an all stainless steel 316L construction with Viton O rings seals and a choice of PUR, PVC or FEP vented cabling. The IMSL is used for measuring groundwater, aquifer, reservoir and borehole water level. A wide choice of electrical output signals is available with 4-20mA for use in process plants and utilities, 10V, 5V dc voltage output signals for telemetry or data acquisition equipment and mV/V or 0-2.5Vdc outputs for applications requiring a low power consumption. Monitor the level of small tributaries as part of a flood monitoring warning system. Measure the water level inside a agricultural water tank. Submerge the sensor in a hydroelectric penstock to measure the water level. Measure tank levels in a rainwater collection system and send the signal output from the sensor to telemetry instrumentation to remotely monitor tank levels or automate water transfer between collection and storage tanks. Monitoring level in a 600 mm diameter pipe in a small scale hydroelectric power installation. Measure the depth in an underground diesel tank. Is this transducer available in 0-3mH2O or 0-5mH2O? Yes the IMSL can be factory set to any scale you want to specify, from 0…0.5 up to 0…100 mH2O, but once it is set, it’s fixed with no adjustment. We need a sensor for measuring the groundwater height in a 13m deep borehole well. The stable groundwater is around 10m deep. We will use the sensor connected to an Arduino to stop the pump, if the water level falls to the level of the intake, and to restart it once the well recharges. We would suggest a ratiometric 0.5 to 4.5 sensor signal for the Arduino input, which can be supplied by the in-built arduino sensor supply voltage of 5Vdc. We are looking for a submersible level sensor to be connect to an Arduino data logger for monitoring stream depth from 0-2m. The Arduino board has a 5Vdc supply and 0-5Vdc input, so we would suggest the IMSL which has a 0.5 to 4.5Vdc output which can operate off a 5 volt supply, and a low range capability for measuring the depth of shallow water. We need a pressure sensor for measuring depth of pond water and over a range of 0-20 feet with 100 ft of cable, which requires low power to operate so we can use it with our wireless systems. Do you have a wireless system that can go along with it and send sms to mobile phones? 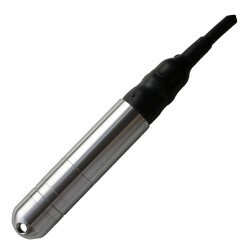 We would suggest a IMSL submersible level probe is used to measure the water level, and this can be a low power mV version which would be ideal for a battery powered system. Also the RAMPORT radio modem has an analogue input for the level probe and can be configured to send text alerts. The system can be battery powered and configured to take measurements at user defined intervals. What is the diameter of the submersible cable? The outside diameter of the sensor signal cable fitted to the IMSL is 7.5mm. What do I do with the green and white wire on the IMSL submersible pressure sensor? 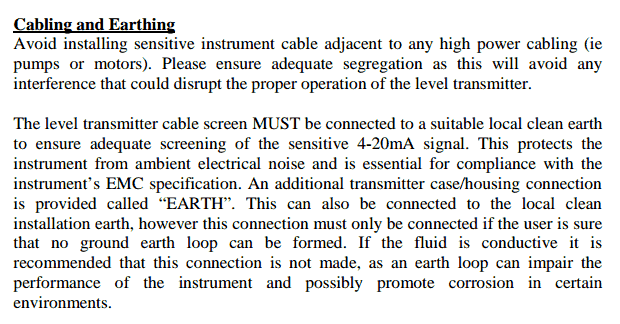 The Green wire is the cable screen and is not connected at the sensor end, so ideally it needs to be connected at the other end to Ground/Earth to provide EMC protection. 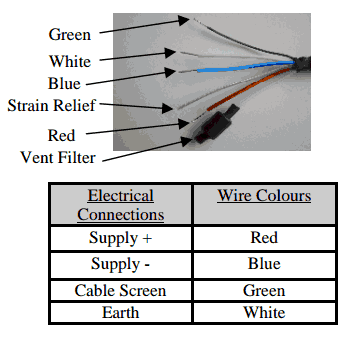 The White wire is for connecting to the Ground/Earth and is connected internally to the sensor body. 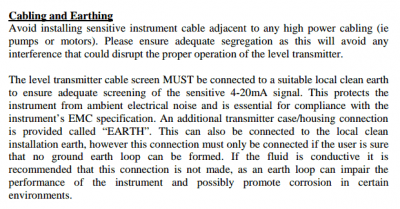 It is not recommended to connect the White wire if the sensor is submerged in a conductive and grounded liquid, since this will create ground loops which will interfere with the sensor signal. What form of lightning protection does the IMSL stainless steel submersible pressure transmitter have, and in event of a lightning strike how does it reset? The lightning protection circuitry conforms to the European standard for EMC protection of EN61000-4-5. The components incorporated into the circuit design are Transil/Transguard transient voltage suppression devices which are not resettable. I need help with selecting a suitable sensor to be used to measure river water level as part of a water monitoring system. We have a data acquisition device which can provide a 5 volt supply and accept an analogue input of up to 0.5Vdc. Will the IMSL meet these input/output requirements? The IMSL has the option for a ratiometric strain gauge output which operate off a 5 volt supply. The output will span from 0-25mV for a 0-1 or 0-2.5 meter water column range. I have a 12′ deep well which is 300 feet away from a house where the monitoring equipment will be installed, is it necessary to specify the sensor with a length of cable all the way to the house? No we would suggest terminating the vented cable running from the sensor at the top of the well using a vented junction box such as the KL1. Then you can use a cheaper non-vented cable to run the distance from the junction box to the house. We would like to screw our pressure calibrator on to the IMSL so that we can perform yearly calibrations in house, will this be possible? Yes, the protective cone can be removed to reveal a 1/4 BSP male fitting which you can connect to a pressure calibrator. What is the working temperature range of the IMSL freshwater level transmitter? The operating temperature range is -20°C to +60°C (non freezing). We are looking for a 4-20mA transmitter for sub 10kw micro hydro electric installations. The submersible instrument required would have a full scale of 2m and a resolution of 10mm or better. It will need to operate and survive conditions in UK water courses throughout the year, although mechanical protection from turbulent flows will be provided. We also install electrical surge protection as standard where there is any significant length of buried cable. We need a pressure sensor to measure the water level in a water tank that is 5.5m deep. The voltage supply would be between 24-29.2V. We would prefer a 4-20mA signal. The following IMSL specification would meet your requirements for measuring water tank level. We would like to monitor fuel level in tanks of generators and we need to use sensors that converts the tank level to a 0-5v analog signal which will be interfaced to a monitoring device. The monitoring device will be about 5-10 meters away from the generator’s tank. The IMSL is suitable for submerging in a diesel tank and the FEP cable provides good long lasting protection from petrochemicals. 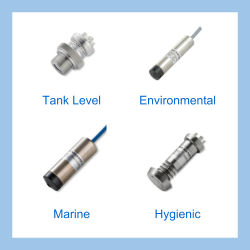 Please select the options you require for the IMSL IP68 Stainless Steel 316L Hydrostatic Pressure Sensor in your application and request a quote. Send us your enquiry for IMSL IP68 Stainless Steel 316L Hydrostatic Pressure Sensor to get assistance with this product type.